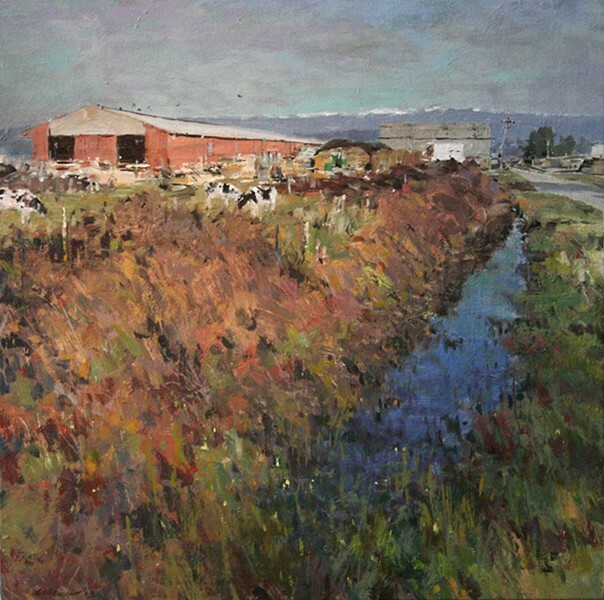 painting by Randy Spicer "Arcata Bottoms #51." painting by Randy Spicer Detail from "Arcata Bottoms #51." 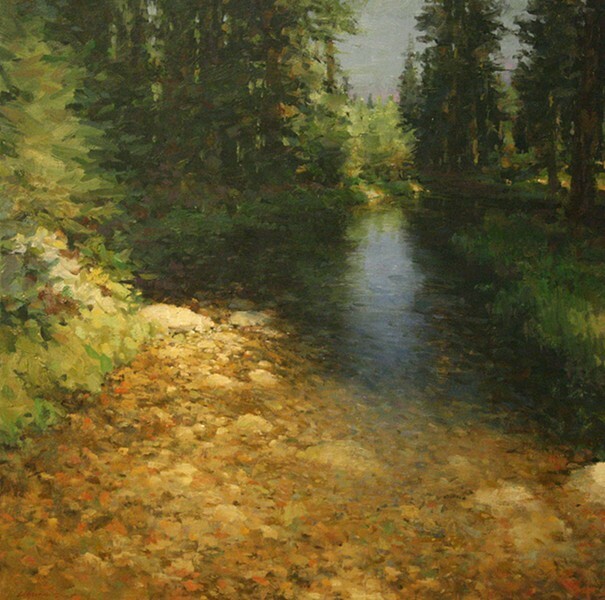 painting by Randy Spicer "Grizzly Creek, Trinity Alps"
Standing too close to an oil painting by local artist Randy Spicer can be somewhat confusing. Smudges of ebony and cream smash together above forceful streaks of brick, olive and eggplant. Dashes of ochre, fuchsia and lime dart about. Inches from the canvas, the shapes elude meaning, their abstract edges seemingly thrown together without purpose. Five steps back from "Arcata Bottoms #51" however, a pastoral scene emerges. The black and white splotches morph into lazy cows munching away near a tractor loading hay into a barn. Birds flap by. In the distance, snow drapes purple peaks. You can almost smell the salty air and bovine aromas of the Arcata Bottom. This duality, this collision of colors up close melting into familiar images when viewed from afar, is a hallmark of Spicer's work. He intentionally avoids the fine lifelike details some painters seek. Instead, kaleidoscopic color combinations provide just enough information while the viewer's mind fills in the rest. "There's two readings," he says, and both near and far examinations of the work are equally important. Look too closely at something and you lose sight of broader connections. And without an eye for the meaningful minutiae, it's easy to miss how they hold the bigger pieces together. Spicer's exuberance is contagious. Stories spill from his wiry mustache, and every sentence brims with a chuckle. "All my waking hours, I'm looking at how I'd paint something," he says. But even an artist has to pay the bills. Originally from Hollywood, he says he's done everything from illustrating greeting cards to advertising to being the art director of a national television magazine. After moving to Humboldt around 1974, he settled into painting full-time. Forty years of making art has made life challenging, Spicer says with a wide grin, but it's also "made it a hell of a lot more fun!" Local readers will recognize his large outdoor mural featuring Louis Armstrong at the Arkley Center's parking lot, and he just finished up another one for a golf shop in Newport Beach. The scale of these murals is impressive, yet Spicer simply says that now that he knows what he's doing, they go pretty quickly. It's enjoyable work, but "in illustration you're solving somebody else's problem," he says, looking over the silver rims of his glasses. He'd rather be solving his own. Trim, tall, always moving, Spicer defines himself as a naturalist, an interpreter of nature. He's constantly climbing, hiking and boating, adventures on which he finds his inspiration. When he spies a stimulating vantage he'll stare at it for hours, taking notes and photos while figuring out the relationships at play. 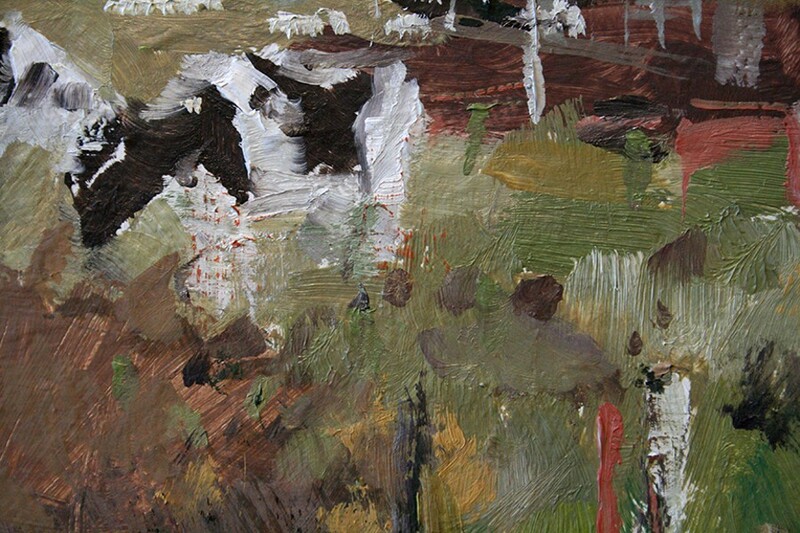 Back home at his studio, Spicer works from dark shades to light, blocking in large shapes with loose, sketchy strokes. Painting is a physical experience for him, and he uses the largest brushes possible. Spicer's swipes of oil push each other around, their shades mingling and mixing in unpredictable ways. Strokes slice in and out and through each other, creating peaks of pigment on the canvas. The gestural fluidity of his surfaces keeps each painting fresh and lively. Indeed, Spicer tries to "say a lot with the least amount of words." These paintings are not overworked; it's easy to see the texture of the canvas resting below the cacophony of colored shapes. "When I paint, I want it to be fun!" he shouts. Examining the paintings more closely reveals Spicer's color alchemy. Reds somehow have a greenish hue, purples contain bits of orange, and little flecks of color that aren't necessarily part of the natural landscape spring up everywhere. In "Grizzly Creek (Trinity Alps)," a cornflower blue sky's reflection slithers down a canyon of dark green boughs. The foreground's buttery pebbles pile upon one another, their warm tones speckled with surprises of heather, magenta and periwinkle. From a distance, the round profile of each pebble is clearly evident, while up close they're nothing but dibs and dabs of multitudinous hues. Another painting, "Leaf Flotilla (Lewiston Lake)," shimmers with gold and dandelion-colored leaves fluttering above deep pools of ivy green. From across the room the suspended flotilla appears weightless, as if it might blow away. Many of Spicer's titles are the names of locations that inspired him. "I'm just a reflection of what I see," he explains. And he wants others to see it too. There are no symbols or overt messages in these works, just pure excitement at nature's abundant beauty. Smiling and staring at one of his pieces, Spicer reminisces, saying, "This is a really cool place. I enjoyed it, and now it's your turn!" So here's your chance: Randy Spicer's 41 new paintings are at the Piante Gallery during the month of August. An Arts! Alive reception will be held on Aug. 3 from 6-9 p.m.